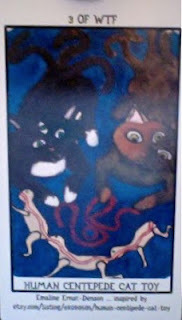 Today's Draw: The Three of WTF—Human Centipede Cat Toy—from the Regretsy Tarot. Do you use your energetic tools consciously to shape your life? Or do just do the best with whatever comes along? When it comes to commanding your own life, do you live more like the cat or the cat toy? We've featured the Regretsy Tarot before. For those of you not there at the time, this deck mocks some of the more ill-fated creative decisions made on popular crafting website, etsy. Don't even bother worrying about which tarot suit the WTF suit corresponds to. It doesn't correspond to any suit other than, perhaps, a hand-crafted, Swarovski crystal-studded business suit for your pet iguana to wear to important meetings. In all its horrific wisdom, though, the Three of WTF poses a good question for you to consider today. The card shows two cats, both bearing the intuitive third eye and a tail for each eye. But that's not the WTF the card refers to. Because the cats are playing with what appears to be entrails, possibly from the Human Centipede cat toy at their feet. While there were no such cat toys on etsy today, a search returned 17 Human Centipede items, from clothing to MacBook stickers. For its decorative use of ric rac, I like this one. But what's more likely to go into MY household is this. We're given these gifts in life...the intuitive awareness that comes with the third eye, the ability to attract and spread energy that comes with the triple tails and an interconnectedness that doesn't require surgical attachment. But do we use those gifts to command our own lives? Or do we just let it lie there like toy entrails on the ground for the universe to play with? Do you really know your power? This card dovetails nicely with this week's nature-inspired reading about the impact we have on the universe every day. Because, along with the ability to disrupt and shape the universe, comes the ability to reshape your life. Those ripples send and receive information every millisecond of the day. We can attract the energies we want, and move out of the direct influence of the energies we don't. We can connect with others in meaningful (again, non-surgical) ways. And we can move and redirect energies in healing ways. So if your thoughts and actions send out waves to create things in your life, are you watching your thoughts and actions? Are you re-molding your life from one of chaos to one of consciousness? Are you using your energies in a healing way? Are you consciously sending and receiving? Or are just kinda doing that stuff when you think about it? Although we're all born to be the cats, it takes work and focus and practice to claim your birthright. It takes thinking of what you want as if you have it, rather than thinking about what you don't have. It takes being conscious of the ripples you send out to others...healing or not? It takes a willingness to drop hate, resentment, vengeance, bitterness and distrust from your emotional vocabulary. It takes gratitude. It takes grace. In other words, it takes an open heart, one not constricted by the thought that you're like some and unlike others. It takes a consciousness of being one with everything. It takes a whole new level of maturity and work. It's ok if you're not 100% on all of that. No one will be at first...or possibly even ever. And it doesn't matter one bit what the person next to you is doing. This isn't about them. It's about you. Their dislike of you has nothing to do with how open your heart can be to them. You don't need their cooperation to make this work in your life. And it also doesn't matter whether you believe in Jesus, Buddha or Salty the Pretzel Man. It's all about stepping into the light, wherever it comes from, and cooperating with it, rather than fighting it. Acting like someone who's worthy of it. And making it brighter, rather than diminishing it. It may seem like a lot of less work to just be the cat toy and be done with it. But when you look at your options in light of the illustration in the Three of WTFs, you'll probably agree, it's far more...palatable...to be the cat.